"TAINTED MEAT! YOU EATING TAINTED MEAT!" We'll never forget those words, or Bob's maniacal laugh, after Episode 3 of this season of The Walking Dead, which picks up with the Terminus cannibals finishing off their free-range human-meat feast. At the start of "Four Walls and a Roof," we see Bob (with his severed leg) wincing as Gareth continues to over-explain the minutiae of cannibalism, including the theory that women taste better because of our "extra layer of fat" for childbearing. "I'm being a human being here. I'm talking to you," Gareth tells Bob. Except that Gareth's talks involve taunting and threatening to eat everyone. Bob listens astutely and then goes from sobbing to cackling. Something like: HAHAHAHAHAHAHA. HAHAHA. "You idiots," he says. "I've been bitten, you stupid pricks! I'm tainted meat." So now the Cannibals' options are to either die of potential walker-poisoning or at the hands of Rick, who's very angry that Bob's missing. Below, we ask again, What Would Jezebel Do? 1. Would we shut out the congregation from the church? This is a tough one. After realizing that Bob, Carol and Daryl are missing, Sasha returns to the church Airbnb and confronts Gabriel, thinking there has to be a link between him and the cannibals. 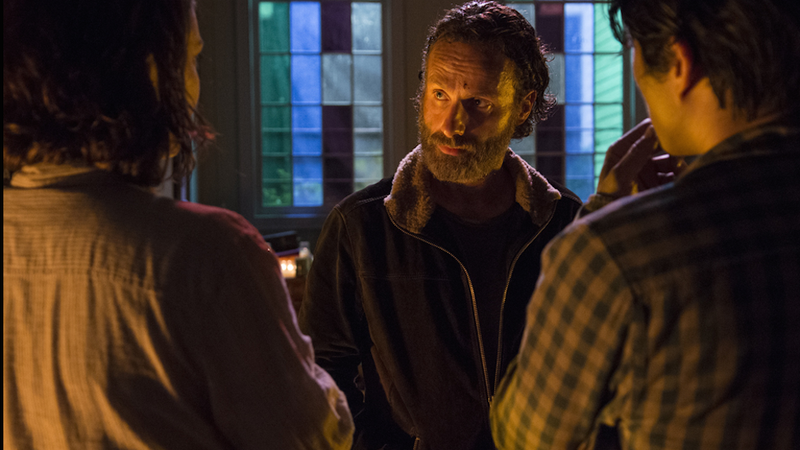 Rick coerces Gabe to tell the truth and we finally get some of his backstory. Early on in the apocalypse, members of Gabriel's congregation came to his church for refuge. Instead of letting them in, Gabriel kept his doors locked, leaving his people outside to die horrifically. It's a choice that now eats at him (intended) everyday. "There were so many of them," says Gabriel. "The dead came for them... Women, children. Entire families calling my name." In the moment, leaving the church door locked seems like the safest solution. But couldn't Gabriel have saved at least some of his congregation? Wouldn't he want strength in numbers? Seeing how Rick's crew has survived as a group, it's clear that multiple heads are better in an end-of-world situation. Salvation, and the idea of who deserves to be saved, is another recurring theme in this series. It's a weird twist of fate that Rick has let strangers like Bob and Tyreese into his group, while a deeply religious man left his own people to die. Gabriel isn't like Rick or Daryl, though. He has no killer instinct. To be honest, we also might've left the door locked out of fear. But the way Gabriel explained it, it seems like people were knocking before the walkers even got there—in that case, we would open it up at least once. But again, this is tough. 2. Would we skip town with Abraham, who's in a rush to get to D.C.? No, thanks: we're staying with Rick. After the Cannibals drop off Bob, Abraham says he's ready to leave before more people get killed. Glenn makes a good point: Um, why in the middle of the night? Abraham wants Glenn and Maggie to come-with, so Glenn agrees to go to D.C. in exchange for Abraham staying another day to help sniff out the cannibals. 3. Would we invade the cannibal camp? 4. Would we kill Gareth on sight? Gareth ends up begging for his life in front of Rick, reasoning that Rick could've killed them immediately so he must have some mercy. It's not that. "We didn't wanna waste the bullets," says Rick. The better option: slicing Gareth with a machete. Sasha meanwhile gets to stabbing, exacting revenge for Bob's kidnapping and dismemberment. This premeditated slaughter might be the second most violent scene of the series, next to Rick's biting that guy's neck. Tyreese hates what he's seeing, but they're killing a ruthless murderer, so there's not much to be sad about. "That could've been us," Rick justifies. Quote of the night goes to Maggie. After a horrified Gabriel says, "This is the Lord's house," she replies, "No. It's just four walls and a roof." 5. Would we embrace a (relatively) humane way of life like Tyreese? Probably not, given the New Rules of living, but this is another tough question. Tyreese isn't as mindless about murder as the rest of them. He speaks peacefully, which in this world is crazy talk. He's a nonviolent, large black man who'd stereotypically be feared in normal, non-zombie life but here on this colorless Earth he's like everyone else. The biggest consensual threats now are walkers and people who've lost humanity. As Bob's dying in the church, Tyreese encourages Sasha to savor her final few moments with him. Then, to prevent Bob from turning, Tyreese slowly pushes the knife into his head instead of stabbing it like we've seen the others do in the past when it's one of their own. So far, this humane (in comparison) approach hasn't been a huge detriment to the group. But Tyreese might be forced to change at some point, just like Rick. Next week, we find out what happened with Beth. Abraham is off to D.C. with Glenn, Maggie and their faction, while Rick and co. stick around to look for Caryl. Daryl returns in the end, but WHERE IS CAROL? ?